ON THIS MONTH’S LETTERS PAGES, Denis Joe worries that we’ve lost focus on responding to young people and are shirking relevant efforts to keep them away from substance misuse (page 10). Our cover story (page 8) is a luminous example of turning the costs of disenfranchised youth into engagement and enterprise. Not only are Amar and his team at The Small Business Consultancy giving young people life skills, adapting negative entrepreneurial skills gained from activities such as drug dealing into positives, they are turning the costs of drug and alcohol related crime into savings and community investment. Their awards evening last week was a stunning example of partnership working in action, with community workers, well-known entrepreneurs, and business investors united in the common purpose of seeing hitherto disadvantaged and disengaged young people start to realise their potential. The scheme is an effective idea that’s really beginning to take off – as demonstrated by their success rates in reducing reoffending and getting young people into training and employment. Watch out for it in areas beyond London. Talking of ideas, it’s seven years this issue since we jumped into the unknown and set up a free magazine for the drug and alcohol field. 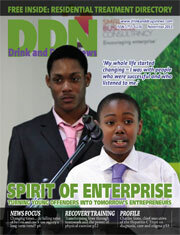 We hope you agree that DDN is still going strong!